Unohana made with lots of different ingredients, including carrots and Sugarlady Chicken. Seasoned lightly. 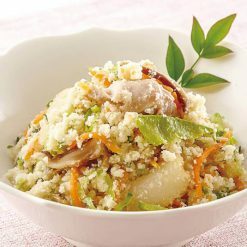 Unohana is a traditional Japanese dish made using okara, several vegetables, and seasonings. Okara, sometimes called “tofu dregs” in English, primarily consists of the pulp left behind when soybeans are pureed and then filtered. The way okara is produced may not sound very appealing, but it is used throughout East Asia in a variety of ways, including in porridges and stews (or, in Japan, in unohana). Okara is high in dietary fiber. In this item, we have combined okara with 7 different main ingredients (carrots, Welsh onions, snow peas, Sugar Chicken, dried shiitake mushrooms, chikuwa, and Satsuma-age) to create a highly colorful unohana. Chikuwa is a steamed or broiled tube-shaped fish product, and Satsuma-age is a fried, cake-shaped fish product. Our unohana is mild in flavor; and its seasoning includes a dashi soup stock made using katsuo (oceanic bonito) and kombu seaweed. Sugar Chicken is Sugarlady’s own chicken, which is raised with no therapeutic chemicals or antibiotics. The chickens are Akadori variety chickens, and consume feed which does not contain hormones or genetically modified crops. Without defrosting the unohana, use scissors to make a cut in the end of the bag for air to escape; then place in the microwave.Approximate cooking times: 2 minutes in a 500W microwave, or 1 minute 30 seconds in a 600W microwave. 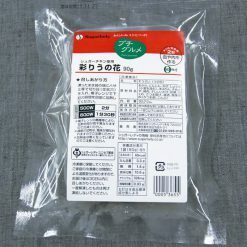 This product contains okara, carrots, Welsh onions, soy sauce (contains wheat), hon-mirin, snow peas, chicken, dried shiitake mushrooms, sugar, chikuwa, Satsuma-age, refined sake, flavor (katsuobushi, kombu seaweed).. Origin of ingredients: carrots/Welsh onions (China), chicken (domestic). Prepared and packaged in Japan.